1975 MA in biology (specializing in, insect behavior), California State University in Long Beach. Steven is an artist, teacher, lecturer, photographer, writer, radio personality, consultant, and environmentalist. Working as a biological consultant for private industry, government agencies, the entertainment industry has earned him a worldwide reputation. He currently teaches biology part-time at West Los Angeles College and is active in educational entomology, art and outdoor education. Steven had an early interest in both insects and art. At the age of four he collected fireflies and wild berries in the Catskill Mountains in New York. When he was a child he received a professional watercolor set from an uncle named Sam Shoulberg. Sam was an advertising artist for Chesterfield cigarettes and the brother of Harry Shoulberg an east coast artist and teacher. Steven moved to California at the age of five. 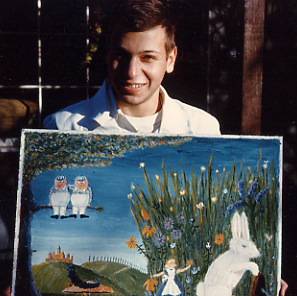 In 1976, after graduating with his masters he became in involved with a local Long Beach Art Gallery where he exhibited drawings and watercolor. In 1978 Kutcher created and taught a class entitled Living With Insects at Glendale Community College. This class was multidisciplinary in scope and focused the relationship between insects and the arts. In the 1980’s he was asked if he could make a fly walk through ink and leave footprints for a TV project Steven Spielberg was executive producing and Kutcher figured out how to make an insect leave fly footprints. Currently he lectures on insects and the arts and has a collection of images showing the diversity of insects in both creative and commercial endeavors. In 2003 He Met Patricia Watts who was compiling works for an exhibit of art relating to insects called Bugeyed (opened 2004). Although his works do not appear in that exhibit she thought his work might be good for that exhibit and that initiated the insect-art synthesis that is currently being created. This work is part of his lectures on natural and primitive art in which he uses natural products like charcoal and ochre to produce art. Steven Kutcher has had well over 100 articles written about him including articles in the Wall Street Journal, Los Angeles Times, Detroit News, and Science World. He has appeared on many TV and radio programs including The Tonight Show, Late Night With David Letterman, Sunday Today, NBC; The Garry Shandling Show (nominated for an Emmy), The Scoop GB (episode won BFTA) and many international interviews. In 1990 The National Geographic did a short documentary on his work in education and the film industry. His innovative involvement with insects has included entering a bathtub on TV and having it filled up with mealworms. He has also taken care of 3000 African grasshoppers for six months, kept 6000 large darkling beetles in his living room, and put bugs on naked women for movies. He has enjoyed working with insects and many famous people, as well as, working with children and enjoying the joy insects bring into their lives. In 2003 he started showing his insect footprint art at his speaking engagements at University of Ill, Texas Tech, and other Educational venues. He has demonstrated his insect art in an art class at Chaffee College and has showed his work at environmental organizations. Kutcher is currently working with new insects and techniques to create this enchanting visionary art. For a list of current and past exhibits (see Exhibits tab for more exhibits). Flower Petal art. 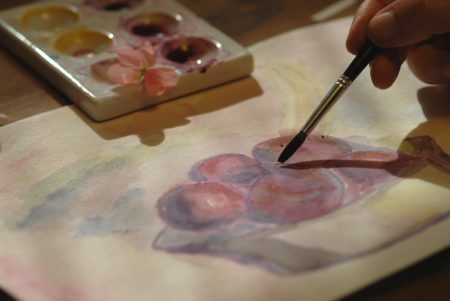 Painting using flower pigment as the only source of pigment. The pigment is derived from boiling flower petals and then evaporating the water in porcelain dishes. The dry pigment is then treated as water color paint. After the painting is completed a digital photograph is take and the image is printed out on water color paper. Copyright 2019 Steven R Kutcher. All Rights Reserved.